A Pete Dye jewel, and a pleasure to play. Purdue University offers a unique golf experience in the Birck Boilermaker Golf Complex. The Kampen Course, a Pete Dye design, is an 18-hole, links-style, par-72 championship golf course featuring large bent-grass greens, fairways and tees. The layout presents a challenge for golfers of all abilities with vast sand bunkers, native grasslands, ponds and a natural celery bog. Kampen offers five sets of tees with the championship tees playing over 7,400 yards and the forward tees playing at 5,300 yards. Kampen is rated one of the top collegiate courses in the nation and has been awarded 4.5 stars on Golf Digest's “Places to Play.” Kampen receives high marks as it is ranked as one of the most difficult golf courses in Indiana. The course has also played host to a number of prestigious collegiate and public tournaments such as the 2000 Men's Big Ten Championship, the 2003 Women's NCAA Championship, the 2004 Indiana Open, the 2005 Women's Western Amateur, and the 2008 Men's NCAA Championship. 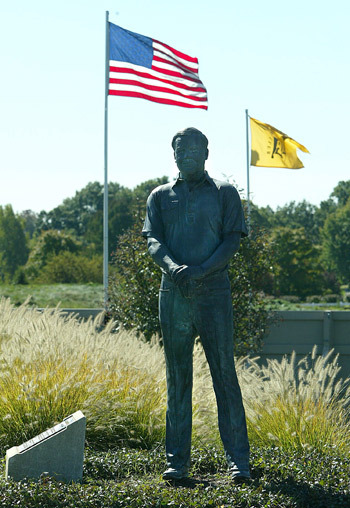 The course is named in honor of Emerson Kampen and his support of Purdue Athletics. Mr. Kampen's statue overlooks the first tee. Good luck as you test your skills on the same layout that the nation's top collegiate players have competed on. Go Boilers! Pete Dye and the transformation of North Course into Kampen Course. In 1994, famed golf course architect Pete Dye walked what was then the North Course of the Purdue University Golf Courses. His goal was to come up with possible changes that could be made due to an upcoming road construction project. Dye's plan became much more than a simple renovation. His personal goal was to produce a golf course that would be both a challenge to the collegiate golfer and act as a classroom for the students of Purdue. With Mr. Dye on board, fundraising began and in the fall of 1996 Pete, Superintendent Jim Scott and 32 Purdue students collaborated on the design as construction began. The departments of Forestry, Entomology, Water Quality Testing, Agronomy and other schools at Purdue all became involved. This was a very unique situation, as Mr. Dye partnered with the University in many phases of the project. The course design includes numerous benchmark features such as a water reclamation process in which all of the water used on the course is recycled. The result of the Purdue-Dye collusion is the Kampen Course, a unique links-style layout with strategically placed waste bunkers, native grasslands, man-made wetlands and large greens. Measuring over 7,400 yards from the championship tees and just over 5,000 from the forward tees, it's a true test of golf for all players. Difficulty exponentially increases as the tee-choice moves back so great emphasis should be placed on the proper set of tees to play. "As a person who calls Indiana home, I am very pleased to have had the opportunity to build one of the finest university golf courses in the country at Purdue." PGA Professional Dan Ross provides a quick tour of the course. 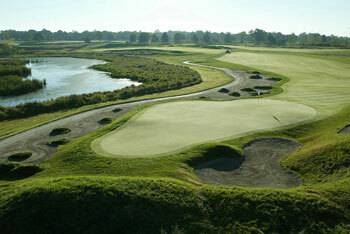 The Kampen course resides on the north side of Cherry Lane and is cut in half by Lindbergh Road. From the parking lot, the golfer gets a great feel for the difficulty of the course as the 18th green stands ominously by itself. In contrast, the 9th green quietly nestles up to the snack shop patio. Kampen is an excellent course in that all facets of a golfer's game are thoroughly tested. 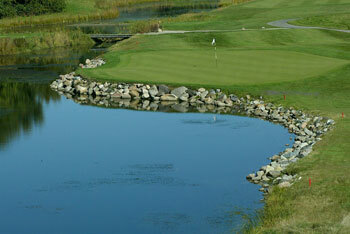 Kampen offers a soft beginning to your round of golf. Standing at 392 yards, the first hole is an excellent taste of what is to come. It's straight, but with Pete Dye's hidden tricks! Bunkers, not readily visible from the tee-box, sneak up on drives that drift down the right side. Birdies are cherished on holes like #1 because Kampen doesn't offer many other opportunities through the rest of the course. Bogey here could set up a long round. As the round progresses, beware of several holes that stand out among the others: namely, the par-5s.The scorecard paints an intimidating picture of Kampen's par-5's. With three holes that measure over 600 yards, any one of which could be deemed best. Dan's preference is #6. It plays into the wind most of the time, periodically making it tough to even reach the fairway from the Championship Tees. It can be a bit daunting with water to the right and bunkers along the water's edge. If you go left, you'll be in tall rough. You're hitting from an elevated tee to a fairway that curves right around the Celery Bog so shot placement is critical. The par-3s require thoughtfully crafted shots into each green. Hole #17 is 210 yards from the back. It's a great hole offering several tee options from multiple boxes. With water sitting not more than just a few feet from the green's edge, each player must decide how much they are willing to risk at a pivotal point in the round. This hole can decide a tournament — and it has! Which is the toughest hole on Kampen? "We have a lot of holes to choose from for toughest," reports Dan. “#18 is a 484-yard, par-4 where you're generally hitting into the wind. You have an intimidating tee shot because trees surround the box creating somewhat of a chute-shot.” Down the fairway, there's a tree to the right, with a large bunker to the left. You're hitting to a large, elevated green, protected by bunkers and Out-of-Bounds to the left. What about the most difficult green? This question is not easily answered because Pete Dye formulated each green with a combination of subtle strengths and weaknesses. Attention should be given to not only the pin position, but the best approach into each green. Reflecting on a number of choices for difficult greens, Dan has a healthy respect for the green on #4, the first par-5 on the front. “It feels like you're hitting on top of a knob! You can roll off into a collection area or bunker,” says Dan. #16 is a 600-yard par-5 that requires three meaningfully-placed shots. Only the big hitter who can place the ball where they need to can reach this green in two. Followed by the already discussed difficult #17 and 18. Each picturesque hole is a testament to the seemingly limitless number of challenges any given round can present. You'll earn it or burn it! However tough the course may play for any given person, one thing is for sure: nature and the Purdue Spirit are masterfully harmonized in this tribute to the great game of golf. Call the proshop at (765) 494-3139 to book your tee time.